We don’t drink a lot of hard liquor, but when we do, we’re definitely tequila people. I’ve gained a reputation for making a pretty great margarita. 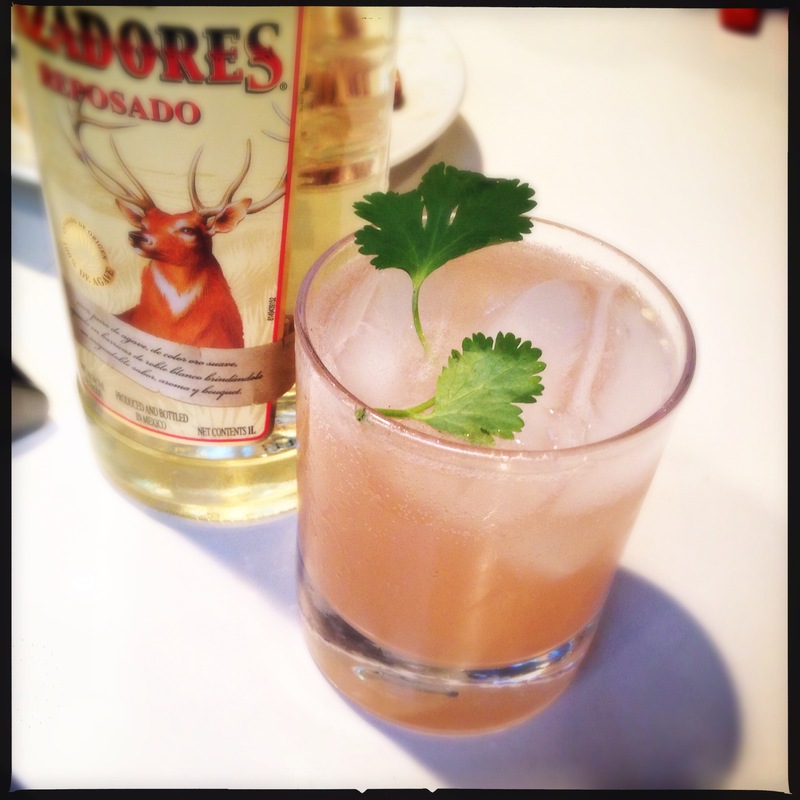 Which leads to the obvious rut — what else can we do with tequila besides margaritas? Because I like high quality ingredients in everything I make, we have a good collection of liquor — artisans small-maker rums from the Caribbean and Havana Club rum smuggled in from Cuba (via Mexico) just for mojitos; fine handmade Kentucky bourbons and peaty aged Scotch; and at least five or six different special tequilas, many you can only get in Mexico. Many of these are sipping tequila — to put them into a drink would be a waste. However, on the next tier is my margarita tequila — usually Cazadores or Camarena — which make splendid drinks. Thus advised, I proceeded to prepare my new tequila drink. Mixology is a bit like baking — unless you really know what you’re doing, you don’t necessarily want to improvise. Once after blogging about a new drink I’d invented that I called Pontocho Road, I received a rather extensive treatise in my Comments section from a mixologist explaining to me proper cocktail rations, which apparently I’d bungled. My online research had led me to a website article on “15 Great Tequila Drinks That Aren’t Margaritas.” It featured several that utilized beer or ginger ale, a few that were very nearly margaritas with one or two additions. They all sounded delicious, but either weren’t what I was in the mood for, or included ingredients I didn’t have (black currant liqueur!? hibiscus syrup!?? Xocolati bitters!!???). Plus, they already all had names — which, if you’ve spent much time on this blog, you know is my favorite part of creating a new drink. Some hip tequila bar pushing the culinary envelope in Hollywood or Miami would probably serve it with ground dried grasshoppers around the rim. But why ruin a perfectly good cocktail for the sake of shock value, I say. Yes! I hadn’t thought of that. We were actually in a Mexican cantina when he was captured, which was very exciting indeed. Great post! It’s funny that you mentioned glasses rimmed with dried hopper because I recently heard of a place in LA that uses grasshopper salt for their rims. Apparently eating grasshoppers is becoming more mainstream so I’m not sure what the shocked value would be. As someone who has Aztec chocolate bitters (of course I do) but has never used them (yup), I am wholly on board with this cocktail. Looks refreshing and I like that it sounds like it’s got some kick. Of course you do. 🙂 The Aztec chocolate bitters were actually for a different drink — a desserty sounding chocolate number. I can send you the recipe for that one, too, if you’d like. Maybe I’ll pick up some Aztec bitters when I’m in Mexico next month! So I can make one, too! I’m quite a fan of the Yurba Buena to break up the tequila rut. Also, consider the many different fruits to be used in margarita’s such as grapefruit, watermelon, cantaloupe, and my personal favorite kumquats. I just returned from Panama City on Sunday night. We had Passion Fruits with breakfast every morning and my wife remarked what a great ‘rita they’d make. Ironically, after a long afternoon of photographing cathedrals and the Casco Viejo of the city, we stopped into a bar and had a delicious snack of a spicy sea bass ceviche that had been dressed with ………………………mayonnaise! Along side some awesome Passion Fruit margaritas. Probably the culinary highlight of the trip. Wow, Panama City, huh? Who would thought?? Spicy sea bass ceviche with mayonnaise sounds suspiciously like spicy tuna roll. Of course, there are no culinary boundaries anymore.